Handling pavers may be hard enough as it is, but by the use of proper tools for the appropriate jobs and materials, the entire experience should be much simpler. 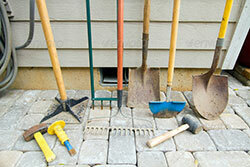 Hand paver tools such as chisels, cutters, and trimmers are suitable for work done on pavers. There are a lot of different types of paver materials, as well, such as rubber, clay, brick, and concrete, and some may be simpler to handle compared to others. Thus, there are certain tools which are perfect for some pavers and perchance not sturdy enough for other pavers. Using the appropriate tools may help steer clear of personal harm, as well as avoiding damage to your paver tools and materials. With the modern technology at present, hand paver tools are becoming less functional as power tools are now available as an alternative. Gone are the times when hands-on tools were utilized for cutting paver tiles. They have become a less practical device for crafting masonries. This is due to the fact that time is money in the business of construction. Thus, hands-on tools have often been just a secondary option. Aside from the time factor, hands-on tools aren’t always as effective when handling hard stone, as well. In such cases, powerful tools are needed. On the other hand, hand paver tools still have their use when it comes to handling pavers. Such tools are utilized in the industry of paving for two major reasons: splitting and trimming. Splitting is a method wherein the pavers have to be broken or cut down into parts. Usually, this is necessitated when the pavers have to fit into unusual spaces or shapes. First, the paver space’s dimensions are measured and markings are made on the paver where it needs to be cut. With a lump hammer, it is then struck several times whilst supporting the paver. This goes on from right to left, whilst toiling your way into the middle. After doing so, the paver should break into the desired dimensions. This is an example of the importance of using hand paver tools, among others. The method of trimming is applied to pavers after they have been broken down with the use of a lump hammer. The paver may require tidying up by trimming its edges, or possibly by getting rid of the tiny shards of the unit. Using a chisel, the pavers are then gradually chipped away until its edges are smooth and of the desired size. Hand tools for paving work are becoming less useful, with the option of power tools available. Gone are the days when hand tools were used for cutting pavers, this has become a less economical form of crafting masonry materials. to be the amount of time it takes using hand tools, compared to the time it takes when using power tools. This is why hand tools are sometimes not the first choice for builders. The reasons for this is that time is money in the building industry. Hence, hand tools have often taken a back seat to power tools. Besides the time factor, hand tools are not always efficient when working with hard stone. In these cases more powerful tools are required. Hand tools however have their place, when working with pavers. Hand tools are used in the paving industry for two main techniques; Trimming and Splitting. Splitting is the process where pavers are needed to be cut or broken into parts. This is usually required when pavers need to be cut to fit into odd spacing. First, the size of the paver space is measured and the paver is marked where it has to be cut. Then using a lump hammer, while supporting the paver, it is struck many times. This continues from left to right, while working your way to the center. After which, the unit should split into the desired size. This is one way of using a hand tool, such as the lump hammer, to split pavers into required size. Trimming pavers is applied after the pavers have been split, using the lump hammer. The paver may need to be tidied up by trimming the edges, or perhaps by removing small parts of the unit. With the use of a chisel, the pavers are slowly chipped away, until the desired size or edging is achieved. So the use of this hand tool enables a smooth edged result. Hence, the benefit of hand paver tools, like the chisel, is that you can perform intricate, detailed procedures, which may be a little difficult with a power tool.